Carly Fiorina won main CNN debate by going head-to-head with Donald Trump. Carly Fiorina takes part in the presidential debates at the Reagan Library on Sept. 16, 2015, in Simi Valley, California. Carly Fiorina jump-started her stalled campaign with a dominating performance at the first second-tier Republican debate last month. Her performance during the second first-tier GOP debate on Wednesday wasn’t quite as strong—but it may prove even more important to her upstart candidacy. On a cramped and overcrowded stage at the Ronald Reagan Presidential Library, Fiorina repeatedly went head to head with Donald Trump, rattling the GOP front-runner in a way that no one else has been able to do, and in the process delivering the best zinger of the night. Shortly after Trump said that Jeb Bush’s since-retracted suggestion that the nation spends too much on “women’s issues” would doom him in the general election (Trump pointed out that Bush gave the cop-out answer that he had “misspoke”), CNN moderator Jake Tapper asked Fiorina to react to Trump’s suggestion that Americans would never be able to vote for her because of her “face.” (The Donald now claims that when he said the word face, he meant the word persona.) 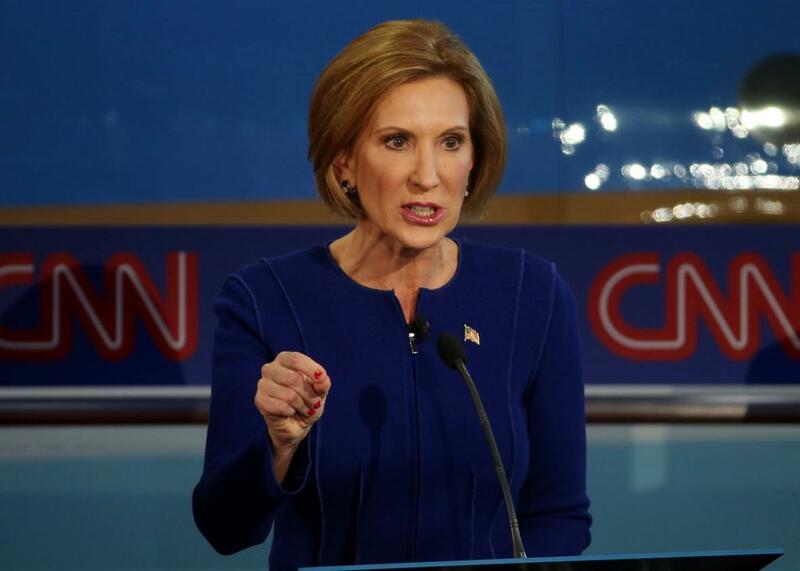 “You know, it’s interesting to me,” Fiorina responded calmly, “Mr. Trump said that he heard Mr. Bush very clearly and what Mr. Bush said. I think women all over this country heard very clearly what Mr. Trump said.” The line garnered probably the biggest applause of the night. On a night where canned answers were commonplace, Fiorina’s spontaneous-seeming one-liners and applause lines stood out. As did the red meat she tossed to the crowd on hot-button topics like Iran and Planned Parenthood—she didn’t let facts get in the way of a good talking point on the latter topic—and her answer to which woman should be on the $10 bill. (While her rivals’ responses ranged from the obvious, Rosa Parks, to the absurd, Mike Huckabee’s wife, Fiorina dismissed the change as an empty gesture.) Her rewards were plentiful: The moderators gave her more time, the Internet gave her more Twitter followers, and the 500-strong crowd of Republican faithful repeatedly showered her with applause. There were other strong performances onstage: Marco Rubio was solid again, Ben Carson played the strong-but-sleepy type that his fans seem to love, and Chris Christie managed to remind the country that he’s still in the race. And at this point no one should be surprised if Trump escapes Southern California with his polling lead in place. But for Republicans desperate for someone—anyone—to hold his or her own against a front-runner they can’t seem to shake, Fiorina may have just convinced many that she’s a woman worth watching.